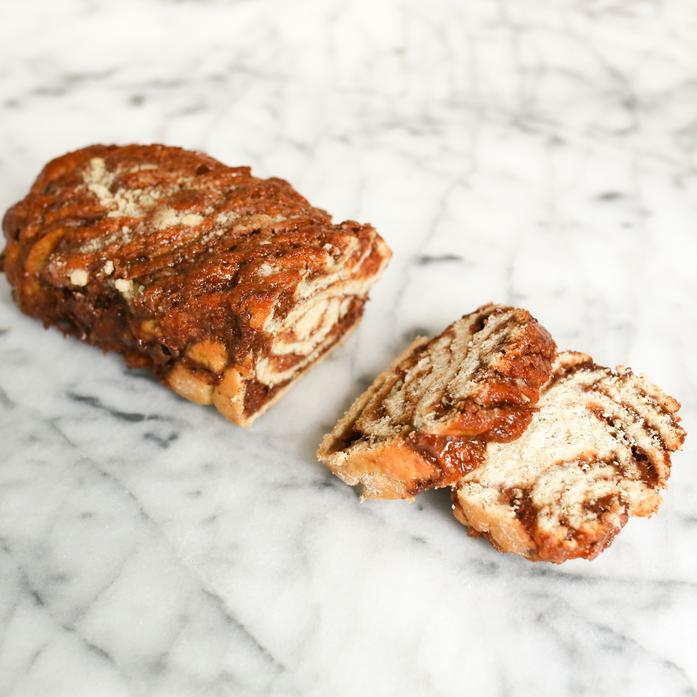 Finally, a gluten-free babka that captures the buttery, flaky goodness of the original! With swirls of warm, rich sweetbread and spicy cinnamon, this luscious coffee cake is topped with a mouthwatering sprinkle of streusel. So sweet and comforting, it’s no wonder the name means “grandmother” in Polish. Ingredients: Brown sugar, rice milk, potato starch, non-gmo palm oil, tapioca, egg yolks (egg), local eggs (egg), brown rice flour, millet flour, pure cane sugar, sorghum syrup, canola oil, ground cinnamon, egg whites (egg), natural fiber, confectioners sugar, sea salt, gluten free oat flour, xanthan gum, apple cider vinegar, orange marmalade (sugar, bitter oranges, cane sugar, concentrated lemon juice, fruit pectin), yeast, pure vanilla extract.